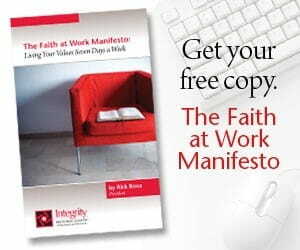 Part of what I do is to help businesses develop a God-centered plan for their future. Craig and I were reviewing his recently crafted vision, mission, and values statements when I gave him the opportunity to breeze through this section. He refused. If your business needs help planning for the future using God’s principles, click here to learn more about Integrity Resource’s consulting.